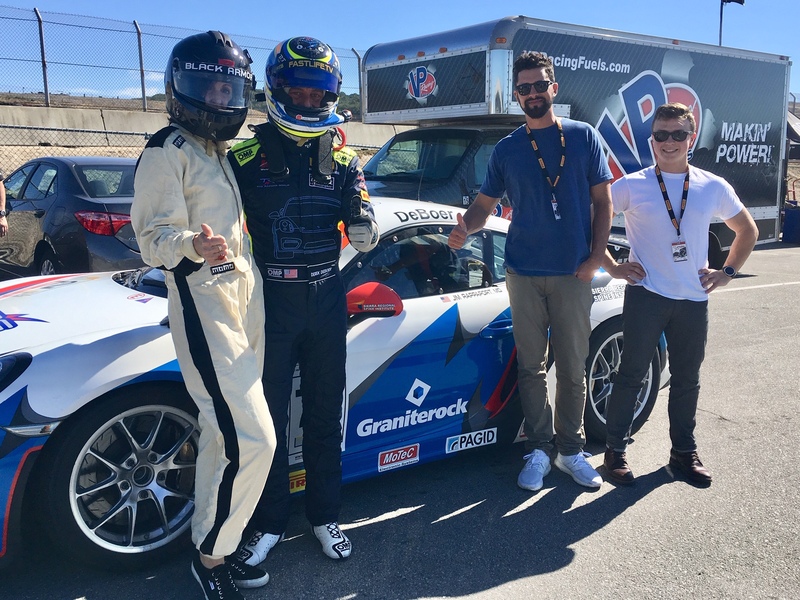 The company teamed up with professional race car driver Derek DeBoer of The Racers Group to put the sweepstakes winner in the passenger seat of Derek’s Porsche for a hair-raising spin around the world-famous track, which is happens to be paved with Graniterock hot mix asphalt. The four-week sweepstakes was open to the public and Graniterock customers through the company’s construction industry newsletter Rock.Paper.Scissors., website, social media, emails and word of mouth. The lucky winner for the VIP experience was Charlie Bower of Case Pacific. Charlie invited Case Pacific project engineer Cameron Lane to join the California 8 Hours Challenge by Pirelli at Laguna Seca, where both were treated to lunch with Derek and his team, front row seats to watch the team’s practice session and two laps around the track with Derek at speeds reaching 140 mph.